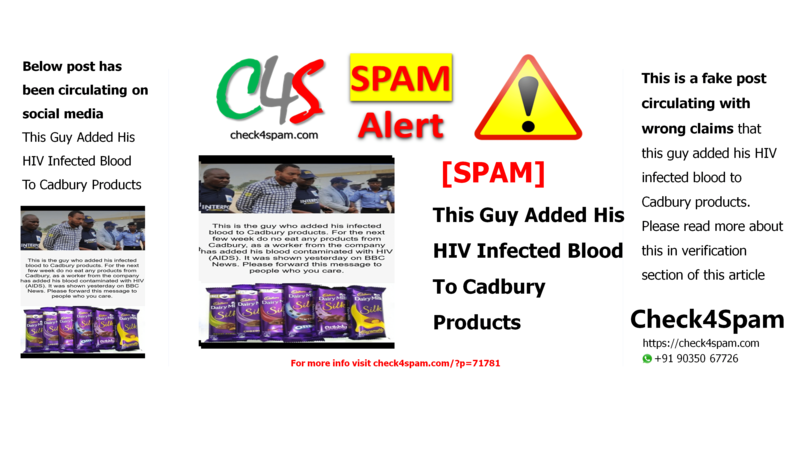 This post circulating on social media with wrong claims that this guy added his HIV infected blood to Cadbury products. Please find more details in this article. Federal High Court in Abuja on Monday ordered the Nigeria Police and the Department of State Services (DSS) to produce a suspected member of the Boko Haram sect and alleged mastermind of the Nyanya bomb blast in Abuja, Sadiq Ogwuche. We found the below image on this site and this resembles the image of a baby girl in viral post. You can see the cap and the vibhuti on her head. The bedsheet colour is also the same green. The prepper pages article was published on 24 May 2015. Reasons of the death is diffarant. The same image is also used for the viral post about Cadbury. So we can now be clear that the fake post is being created by using images from here and there. There is no fact to this claim of HIV virus in Cadbury or Pepsi or fruits or any other thing. People just waste time and energy to make such hoax and feel good to fool others. Without the facts one should not post and share information, specially when it comes to the health. Without confirming from the known sources, dont just pass on these kind of fake messages. It spoils the reputation of Companies and the people working there for their livelihood. Be aware of such false informations on social platforms. Some people use it for good and some for bad purpose. Share the truth , not the fake.